The ’70s were a crafty decade, thanks to the roving bands of stray hippies who helped popularize a “back to the land” lifestyle that saw even everyday folk making their own clothes and toys (while wearing out copies of the Whole Earth Catalog). Credit also the decade’s economy, hampered by inflation and gas shortages, which prompted people to look for ways to save some dough by going DIY. Whatever its origins, there was a mania in the ’70s for the old-timey: turn-of-the-century motifs in theme restaurants and product-packaging; fashions influenced by the ’20s; low-budget crime movies set during the Depression; rock music with a “down home” flavor; and on and on and on. Puppeteer Jim Henson was very much in step with those times, both in his callbacks to vaudeville on The Muppet Show and hisevocations of rural living in projects like the TV special Emmet Otter’s Jug-Band Christmas. Emmet Otter is especially artisanal in look and message. Based on a 1971 children’s book written by the late Russell Hoban (and illustrated by his then-wife Lillian), Emmet Otter follows the story of a poor-but-happy young otter and his widowed mother, who scratch out a living doing odd jobs up and down the close-knit river community of Frogtown Hollow. Henson’s workshop uncannily recreated the feel of Lillian Hoban’s drawings, crafting small, fuzzy figures all bundled in fabric. The characters don’t move as smoothly as the Muppets do on The Muppet Show or in The Muppet Movie (two contemporaneous Henson projects). When they walk, they look every bit like marionettes, and when they talk, they look like toys populating a playset. The legacy of the TV version of Emmet Otter fits its hands-on aesthetic. After debuting on HBO in 1977, Emmet Otter enjoyed a few years as a perennial for parents with premium-cable subscriptions, then played ABC for a time, and then kicked around basic cable before largely fading from the Christmas rotation. In part because of the corporate partnerships undertaken by The Jim Henson Company, Emmet Otter has been sort of orphaned, not included among the holiday staples on ABC Family and the like. (Even the home-video editions that have been released over the years have been truncated, eliminating all traces of the original host and narrator, Kermit The Frog.) But those who love Emmet Otter have continued to keep it alive, making sure to watch their battered VHS and DVD copies every year and to share the experience with their own children. Whether those children respond to the special is another matter. Maybe Emmet Otter failed to become a classic because of the vagaries of show business, or maybe it’s just too much of its era, and doesn’t translate easily to generations more used to computer-generated images than to scruffy-looking puppets playing out a story about sacrifice, industriousness, and collaboration. Emmet Otter has a plot that’s half O. Henry, half Little House On The Prairie. When Emmet and his mother hear about a local talent contest with a $50 first prize, they each daydream about what they could get each other for Christmas with that money. Ma wants to buy Emmet a guitar; Emmet wants to put a down payment on a used piano for his Ma. But it’ll cost them both money to make money. Ma will have to hock the tool chest that Emmet uses to do fix-it work around town in order to buy material for a decent dress for the show, while Emmet will have to put a hole in the washtub Ma uses to do other people’s laundry so that he can make a bass for his jug band. … Williams’ music never sounds out of place. Even when Emmet and Ma are challenged at the talent show by the rock-’n’-roll-loving juvenile delinquents in The River Bottom Nightmare Band, Williams produces a credible version of Alice Cooper style shock-rock. Still, for the story to work, both Ma and Emmet have to lose. After all, they couldn’t beat each other; that wouldn’t be a satisfying ending. Instead, they each go onstage with separate songs—Ma’s angelic ballad “Our World” and the jug band’s ebullient “Brothers,” their last-minute substitution for “Barbeque”—and though both are excellent, one of the judges, Ol’ Doc Bullfrog, suggests that they were each missing something. Sure enough, when they combine the songs, the results are both beautiful and relevant, echoing the message that a world that says, “Welcome, stranger,” is the only kind that really works. In the end, that’s what Emmet Otter is really about. There’s a lot more about money in this story than in the typical children’s Christmas special. Jerry Juhl’s script counts every penny, and takes account of how much it costs to knit a scarf, which can be traded for a pumpkin, which can be made into a pie, which can be sold to buy more wool. The only way to survive in this kind of economy is to pool resources and think creatively. And yet the beauty of Emmet Otter is that it never treats life in Frogtown Hollow as miserable. Ma and Emmet have their sense of humor, and the ice-slide that Pa built before he died, and their memories of how Pa would always bring home a “Christmas branch” instead of a tree because he couldn’t bring himself to chop a tree down. In other words, these lives have meaning and texture, which Henson and his team emphasize via the depth of detail in their sets, filled with tiny little houses, actual water, actual pine, and even actual pie-dough for the Ma puppet to roll. The camera explores this space, giving it a three-dimensionality that no special glasses could replicate. 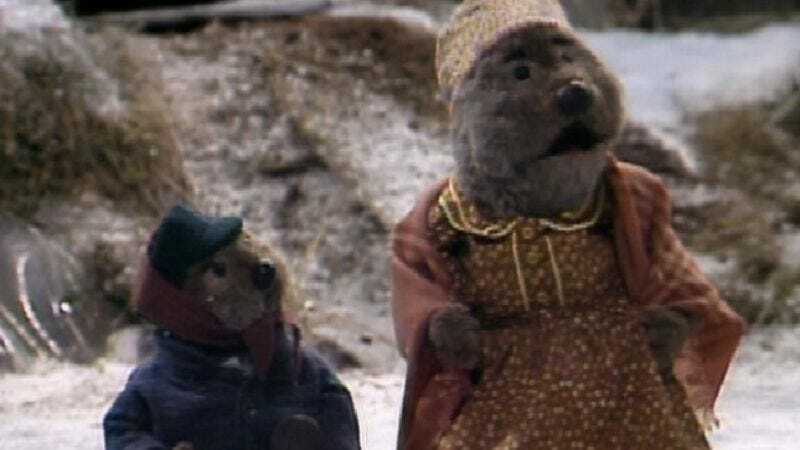 Emmet Otter’s Jug-Band Christmas is the kind of Christmas special you could wrap in tissue when the season’s over and store carefully in a box in the attic. Each year at Christmas there are new toys to play with, which is fine. But it’s the hand-made ornaments that are always the first to go on the tree, and which lend blessed continuity to the season. Tomorrow: A holiday classic in triplicate.